"The More We Learn The Less We Know." There is an interesting story behind how The Media Ant came to being. It happened when Samir Chaudhary, the CEO had to struggle to work out an affordable marketing plan due to low budget. The dearth of information sources pertaining to available media options inspired him to think of this marketing community that acts as an online assistant for similar solutions. 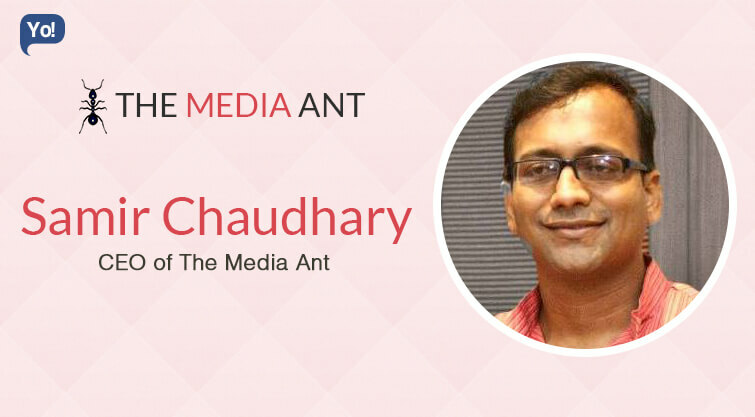 Prior to founding The Media Ant, Samir Chaudhary worked as product manager at Britannia Industries Limited and gained crucial marketing experience as marketing head of redBus. Although the journey was quite difficult ahead but he made it simpler with his friend and co-founder Mukesh Agrawal and Mayank, who equally believed in his idea. His company covered the distance from 300 to 3400 media options listed with site within a year and got wonderful response from businesses. Whether it was about implementing a unique business idea or driving sales of big brands, Samir always enjoyed his work and won over all challenges that came along. Read more about this nifty businessman. The Media Ant (TMA) is an online assistant for the Marketing community. TMA has the largest aggregation of information about media rates & reach, listing of Marketing agencies and a Q&A forum dedicated to marketing. Marketers and small businesses use it to execute their marketing task. With more than 200,000 touch points we are world’s largest Media discovery platform. The genesis of The Media Ant lies in my previous role as Marketing Head at redBus. I was working on a marketing campaign with a small budget and could not afford an agency. Getting information on available media options like price, reach, past examples, case studies etc. were painful and involved calling and meetings in person. There was no single online platform that could be used. The Media Ant as a concept was born then, an online platform for the marketing community, a marketing assistant who could be reached out to any time. Do what you enjoy doing. We were clear from day 1 that we will not charge for the information or listing. Democratization of information was core to our belief. The biggest challenge we faced was finding the right business model to continue running this free service. We tackled them by keeping the cost to a minimum and using technology as much as possible to aggregate and share the information. We are completely bootstrapped. At the time we started, we got Rs 5 Lakh grant through ET Power of Ideas. Since then, we have generated enough operational income to build the team and create products. Most of the guys join us (knowing that we are a startup) because they believe in the dream and want create products. They leave when there is lack of challenge and growth at work. We at all times try to provide the team a challenge and an environment to create. In my view, that’s the only thing that keeps the team going. Letting my mood impact how I interact with my team. Believe in your dream and in your team. Promising when happy and reprimanding when angry. Identify pain areas of the marketers and businesses around marketing. Use technology to create solutions. “The More We Learn The Less We Know”.